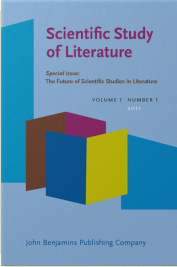 A significant event has recently occurred for the psychology of fiction: the publication of the first issue of the field's own journal Scientific Study of Literature. The journal's editor is Willie van Peer, and OnFiction's own Raymond Mar is an associate editor, a function he shares with Max Louwerse and Joan Peskin. This first issue of the journal has articles by many well known people in this newly developing field; you can find the list of authors and the titles of their articles by clicking here. Names are often a bit of a problem, as I gather they were in the naming of the new journal. We've found this too when we talk about the psychology of fiction: we don't just mean prose fiction, we mean poetry too, as well as plays and films, and we'd also like to include some kinds of biography and history. Perhaps we should say the psychology of narrative, but that seems too broad. So people have to be a bit understanding, because we don't have a well delineated category. We'd like the category to be defined by its content: something like stories of intentions and vicissitudes of selves and others in the social world. So far as I can tell, the scientific study of literature (fiction, narrative) began in the early years of the 20th century with two groups of linguists, in Moscow and St Petersburg, who became known—by way of a sneer by the Bolsheviks—as the Formalists. The Russian Formalists' most famous members were Roman Jakobson and Victor Shklovsky. The group's goal was to study literature as such, scientifically, and not treat it as a species of political moralizing. The group's exclusion of politics from their considerations was why the Bolsheviks sneered at them. A concept that the Formalists' firmly established is "defamiliarization," the way in which literary language can make something strange, distinct and individual, so that it comes alive, so that it is not just passed over thoughtlessly, out of habit. In his 1917 article on the topic Shklovsky offers an example of the principle from Tolstoy's short story "Kholstomer" (Strider), which is narrated by a horse. I understood full well what he said about flogging … But then I found it impossible how and why I could be called man’s property. The words my horse referring to me, a living creature, struck me as strange, just as if someone had said my earth, my air, my water ( p. 86). The idea was later developed by Jan Mukarovsky (1932) of the Prague Linguistic Circle, who coined for this idea the term "foregrounding." One of the earliest laboratory experiments on the psychology of fiction was on this very concept. It was published in 1986, by Willie van Peer, the new editor of the new journal Scientific Study of Literature. He argued that foregrounding is accomplished by a writer offering something linguistically unusual: creating variations from ordinary usage. He asked the participants in his study to read six short poems, the linguistic content of which he had analyzed to determine which phrases were foregrounded. He found that phrases that were foregrounded were experienced by readers as more attention-drawing, more striking, more important, and more worthy of discussion, than other phrases. In this experiment, linguistics is linked to psychology. The artist offers something that draws attention because of its linguistic structure. When it works well, a defamiliarizing, foregrounded, phrase psychologically enables the imagination of the reader or viewer to expand creatively within its context, and within the structure of the attention that the artist shares with us. Having a journal devoted to the relation of literature (poetry, fiction, narrative, or whatever it should properly be called) to the psychology of its reading, hearing, and watching, and to the psychology of its writing, is an outcome that those linguists who started the idea nearly 100 years ago may have been pleased to hear about. Jan Mukarovsky (1932) Standard language and poetic language (click here for download). Victor Shklovsky (1917). Art as technique (L. T. Lemon & M. J. Reis, Trans.). In D. Lodge (Ed. ), Modern criticism and theory (pp. 16-30). London: Longman (current edition 1988). Leo Tolstoy (1885). "Strider" (Kholstomer). In R. Wilks & P. Foore (Eds. & Trans), Leo Tolstoy: Master and man, and other stories (pp. 67-107). London: Penguin (current edition 2005). Willie van Peer (1986). Sylistics and psychology: Investigations of foregrounding. London: Croom Helm.